Posted January 21, 2015 . The iOS simulator and Genymotion are good and all, but there are cases where we want to run our apps on real devices. Running on devices definitely gives a different feel. This tutorial will show you how to run Ionic on real devices via the terminal. For this tutorial, I’m using iPhone 5S running on the iOS8 and HTC One running on Android 4.4.3. Close or Quit any Genymotion or AVD’s. We have to close any Android virtual device because the Android SDK recognizes them as real devices. For instance, if we tried to run the project, the virtual device might take precedence over the connected Android device, and the project would get installed onto the virtual device instead. This step is just to be safe, but it’s up to you. You must save your changes and build for each platform so that when you run your project on real devices, the changes will be reflected. This is necessary to run on any iOS device. Just go to Apple’s developer portal and create a developer provisioning profile. By this time, you must have an iOS Provisioning Profile and make sure that it’s recognized by Xcode. Ready?! In your project directory, go to platforms > ios and you should see the Xcode file. 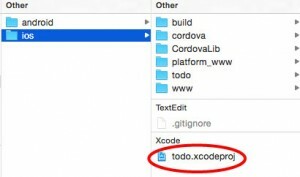 Double click that Xcode file and wait for Xcode to load your project! Go to Xcode and update the Bundle identifier to match the one you used from your iOS App ID Hit save (command+S). On Xcode, look at the top right corner. Choose your device and click Run. Have your Android phone turn on Developer Options. Some old phones have them on by default. But (I think) from Android 4.0 and above, the Developer Options are turned off. Once you turn them on, enable USB debugging. Go to your phone’s Settings app > About > find a Build Version. Tap the Build Version 7 times. Go back to the home view of the Settings app. Developer Options should be in the list. Usually it’s near the About option or next to it. Tap the Developer Option. Scroll down to find USB Debugging and check it. Go back to the terminal and type the code below to run for Android. Then just eyeball the Android device. It shouldn’t take long for the app to install and start up. You can also look at the terminal for statuses. Your Ionic app should be running on real devices now, for both iOS and Android. Hi there, thanks for this tutorial, but I was wandering if there is a way to do that with command line. Hi Ben. Thanks for reading. To answer your question, the “code” examples in this article are the commands done on the terminal in MacOS (command line). But do you mean the command line in Windows OS? Thank you! This tutorial helped me how to build an app which can be run on a real iOS device. That’s great Eddy. Have fun with Ionic! Great post! Clear and useful. I am facing problem while adding Android platform i ionic. Thank You! You helped me to run on a real IOS device. i am trying to run on oneplus A3003device but while running ionic run android it is going to emulator..
Hi ojus. Try this: first unplug your Android device. Then, turn off any emulators. Plug the Android device and type ionic run android. I’m assuming you have turned on developer options for your Android device (since you read this article). There are times when I do need to download new SDK’s. Try that. API 23 Marshmallow is old. I’m guessing your ionic and cordova versions in your project are up to date but your Android device’s operating system and your android SDK are not. I’m running the app in a real device but i encountered an error in which the app icon has been replaced by the ionic icon. I’ve been following the steps in the net but still the error persist. Hope you can help me with my error. I don’t have android SDK or any Emulator installed in windows 7 system, I am trying to run it on Real Samsung Android Device by connecting to the USB. Failed to find ‘ANDROID_HOME’ environment variable. Try setting it manually. Failed to find ‘Android’ command in your path. Try update your path to include PATH to the valid SDK directory. I am having problem while trying to run the application on Android. I have got the configurations fine. When I run the command i.e., ionic cordova run android, the APK gets installed to my Android device but ionic server suddenly exits. I have tried setting different ports as well but that didn’t help either. Here are the last few lines on the console. No target specified, deploying to device ‘LGD858HK5db30587’. [ERROR] An error occurred while running cordova run android (exit code 1).